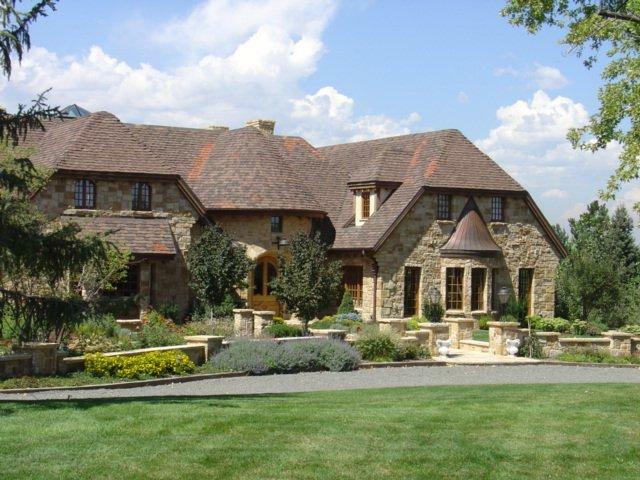 The famous Castle Rock, overlooking the Town of Castle Rock CO.
One of many beautiful Castle Pines Homes! Nestled in the rolling hills of lush green and colorful wildflowers against a backdrop of Ponderosa pines, Gambrel oaks, and views of the eastern border of the Rocky Mountains, Castle Pines Village homes enjoy one of the most spectacular natural settings in the entire region. Welcome to a community that is metro Denver’s premier gated, planned and highly secure community. The original developer, Jack Vickers, had a dream 30+ years ago to to create the preeminent community in Metro Denver that it has become, and he is still involved with the process. The custom, semi-custom and master designed luxury Castle Pines homes harmoniously accent the areas exquisite natural beauty and are one of Colorado’s best-kept secrets. Immediately north of Castle Pines Village is Castle Pines North, which features ‘move up’ and luxury Castle Pines homes and both offer superb recreational facilities such as excellent parks, sporting and activity centers and equestrian, nature and bike trails. Castle Pines Village and Castle Pines North is a community of approximately 13,000 dedicated to excellence in quality of life. The award winning schools of the Douglas County School District with modern facilities serve students in grades K-12. Many parents will choose Castle Pines homes primarily because of the strong reputation of the schools. Golf – Did you say Golf? Castle Pines North and Castle Pines Village offer its residents premiere golfing venues with two clubs that form the heart of Castle Pines – Castle Pines Golf Club and The Country Club at Castle Pines, both designed by Jack Nicklaus. From 1986 to 2006, the PGA tour stop here was ‘The International’ played at the Castle Pines Golf Club. 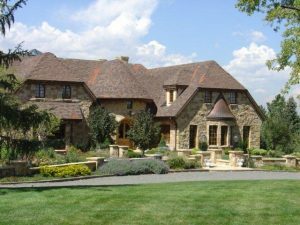 There are a number of Golf Clubs/Courses and properties in the area, so see our Castle Rock, CO Area – Golf Homes Link for more info. In addition to Golf, Castle Pines residents are very sports minded and active in all junior sports, as you will see on any weekend in Castle Pines with the playing fields and pools all being used and booked up! The Denver Metrolist inventory of beautiful executive Castle Pines homes offers a broad and sundry assortment of price sand style. Single-family detached homes in Castle Pines North start in the mid $300’s and range up to $1.2 million. Homes in Castle Pines Village with community golf and pool facilities and scenic hill and mountain views are priced from the $550’s. Beautiful estate properties with scenic hill and mountain views, multiple fireplaces and spacious lots start at $1.4 million, range up to more than $10 million for luxury estates with acreage, and designed by noted architects. Condominiums and townhouses range in price from the $200’s to the $600’s. A limited selection of land and lots are also available for custom development, with some being on the golf courses. This safe, lively family-oriented community also enjoys proximity to nearby Denver and the benefits from the area’s thriving economy. If you are looking for Castle Pines homes, you will soon discover that there are so many good options available that it is almost hard to know where to begin. This is where an experienced Castle Pines Colorado real estate agent can become invaluable. I know the neighborhoods, the schools, the local amenities, and market trends for Castle Pines homes. Call me for a free, no-obligation consultation. No pressure… just facts! See how Castle Pines North and Castle Pines Village ‘fit’ into the south Denver Metro area with this Google Castle Pines Map. You can see the huge open space between Castle Pines North and Highlands Ranch called ‘BackCountry’ and Daniels Park to the west. This 1,000-acre historic ranch in Douglas County is known for its bison herd, dramatic view of the mountains, historic ranch buildings, distinctive stone shelter, and Tallbull Memorial Grounds.